AIPU Mud gas separator for sale with good discount and delivery in stock now. 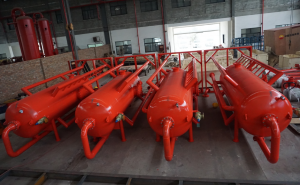 We have 6 sets separator stock in warehouse built in Aug of 2018 for a China drilling contractor, but the client delay requirement and we are promoting to sell the 6 sets stock and will build new degasser later once our client confirmed requirement time. The degasser is normal pressure but high press degasser as per ASME standard can be supplied as per request. Confirm us technical requirement of gas separator, so that we can check if our stock will meet your technical parameter. Gas separator vessel diameter is 1000mm size for mud flow 300m³/h, mud inlet size 5”, mud outlet size 10” and gas vent line size 10”. 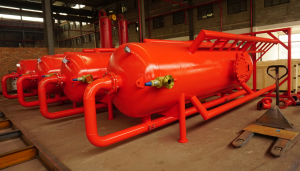 Pressure of gas separator is normal pressure within 1Mpa. High pressure standard can be supplied as per ASME standard with extra cost rate. Minimum quantity of order is 1 set degasser, 2 sets order is our suggestion because of minimum freight rate into 1 set 40 feet container. Send us purchase order or sign contract between each other. Separator will be sent after received full payment. Aipu delivery gas separator by sea into container and send a full set of document to buyer for custom clearance application. Together with mud gas separator, AIPU supply flare ignition device to burn to waste gas separated from drilling mud. The flare ignition device is normally 30 meters away from separator, so 30 meters gas vent line will be required in drilling site and AIPU is able to supply 30 meters gas line if buyer order mud gas separator or flare ignition device. Please contact us freely.